How Should Sharps be Handled and Disposed Of? You may know that you need to install sharps disposal units in your healthcare or public setting, but what constitutes best practice and local legislation for the disposal of sharps? We cover the essentials below. What are the benefits of safe disposal for sharps? There are a number of crucial advantages to having safe sharps disposal options. The first and foremost is to reduce the number of blood-borne viruses such as HIV and hepatitis B and C that can be contracted through needle stick injuries from used syringes, scalpels or other sharps, either by the general public or by staff in a healthcare setting. It’s believed that upwards of 18,000 nurses and health care workers receive needle stick injuries each year in Australia (source: ANMF), which is an extremely concerning number when you consider the potential health risks. 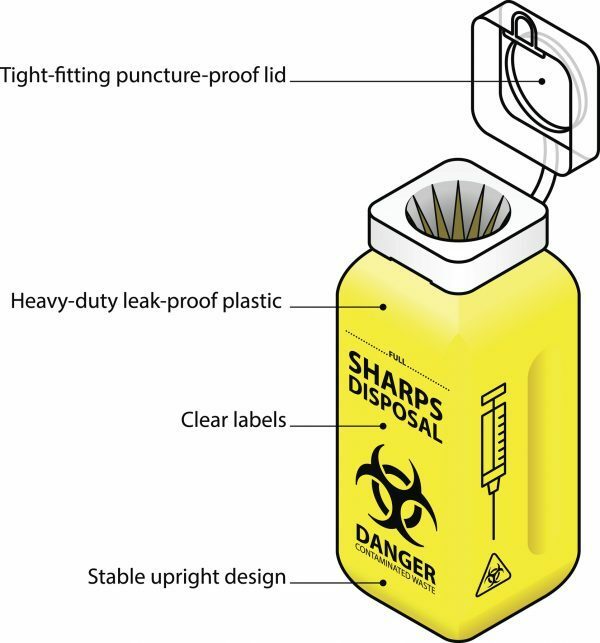 Safe sharps disposal places these sharp items in a strong, puncture resistant single use container rather than in general waste. In addition, the more widely available sharps disposal units become, the more people will be aware and likely to use them. Each state has different legislation regarding the safe disposal of sharps, however the Department of Health does set out best practice information. For safe disposal of sharps in hospitals, universities or a public setting, look to a product that complies with Australian standard (AS4031): Non-reusable containers for the collection of sharp medical items used in health care areas. Education and training is crucial in reducing the number of needle stick injuries sustained in Australia every year. Staff and cleaning teams should be instructed to never directly empty the sharps disposal units, and only to dispose of units as instructed as per local legislation. If a loose syringe or sharp is found this should be picked up very carefully with tongs or a similar tool, and the container should be brought to the sharp item rather than the other way around. This will minimise the chance of any accidental slips or falls. At Davidson Washroom we supply sharps disposal products to hospitals and washrooms around the country. We choose to source our sharps disposal products from the leading Terumo brand. These products consist of a 1.4 litre lockable metal outer container which houses a robust single-use plastic interior that can be safely disposed of and replaced. Contact the team at Davidson Washroom for product and pricing enquiries for your sharps disposal needs.